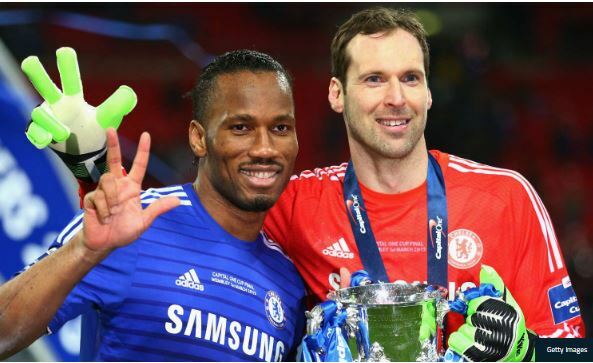 Didier Drogba has paid tribute to his ‘hero’ Petr Cech after the Arsenal goalkeeper announced his intention to retire at the end of the season. Despite moving to join London rivals Arsenal three years ago, Cech, alongside Drogba are considered Chelsea legends due to their immense contributions for the Stamford Bridge outfit. One of such was helping to deliver a first Champions League title in 2012 after they defeated Bayern Munich in an epic final; a European showpiece fondly remembered for Drogba’s bravery and Cech’s great show of shot-stopping. The Czech’s – who turns 37 later this year – decision to hang his gloves have come at the back of losing his starting berth at the Emirates to German goalie Bernd Leno. His move has been well received by his former Ivorian teammate, who took to Instagram to sing his praises. “I would need millions of words to describe you, your good heart, your professionalisms and winning mentality but one picture summarises it all,” Drogba wrote on Instagram. “Thank you my hero Petr Cech for having golden hands and heart. Man saved three penalties and run into me like I’m a legend.